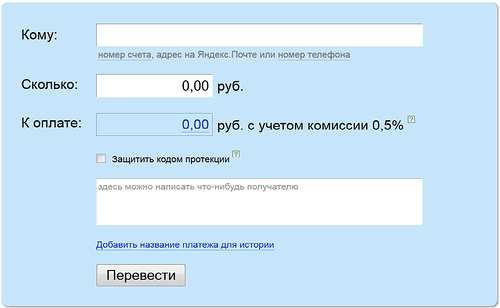 Yandex. Money is one of the most popular payment systems in Russia. This service provider engaged in the business for more than a year, which is why the proven reliability and security of time. In this article, we shall understand, how to translate Yandex. Money and why it is needed. In addition, there are poison, and other representatives of electronic wallets, for example WebMoney and QIWI, they also have their own advantages and disadvantages. Most Russian Internet users use it on the Yandex service probably because, he fully russifitsirovat and initially configured to use Russian users. To carry out the transfer of money from a popular system, as WebMoney, you will need some work. To begin with purchase certificate (not less formal level) and identified by a special poison. After that, go to the website RoboxChange.com, which specializes in translations and read the terms and conditions. It is important to know, that the system will charge you a commission 4,5 % for services rendered. From the list, select the appropriate system, from which you want to transfer funds to and enter the number of purse. Next, enter the amount, that you are going to translate. Enter your personal data in the system. Do not forget, you will have to pay a commission. to understand, how to transfer money to Yandex purse, read on. maybe, you will help the electronic exchange offices. On the Internet there are many proven services, that offer you to exchange between different systems, or transfer from one currency to another, etc.. Very user-friendly features, which may be required in the life of any user. Ask any search engine query and characteristic already in the first row you will find a suitable option. Closely acquainted with the conditions, that you offer to suppliers. You can also make a transfer using Terminal, which can be found in almost any public place, eg, in large stores, gas stations, subway, etc.. Enrich POISON sales offices, such as “Euroset”, MTS, “The messenger”, etc. In any monetary transaction will help banks. This case is no exception, so use to transfer the following companies: Security Bank, VTB 24, credit institution “rib”, SMP Bank, Savings etc.. Usually, the commission is of the 0 to 3%, it is important to examine the information in each bank individually. To replenish Yandex purse, use the services of money transfer systems. The main representatives of: CONTACT, City and Unistream. With a credit card you can recharge your account with POISON, there are several options available to you. ATMs. Such devices can be found in the following institutions: MIB, savings bank, VTB24, Alfa-Bank, Master_bank and other. Some representatives allow their customers to use only certain types of cards. Yandex system offers service, which will simplify all operations with money. To do this, tie the account to the Bank “Opening” or “Alfa-Bank”. After that you will be able to carry out instant money transfers. Use of Internet banks, which allows the exchange and updating of different accounts, including POISON. The Commission will be from 0 to 3%. Transfer of funds to a bank card (MasterCart или VISA). You will need to specify the card number and security code. The commission fee is 15 rub. + 3% of the total amount. And the operation itself must pass during 6 days. Transfer money to the card linked to the Bank “Opening” or “Alfa-Bank”. You can use a bank account. Here you will need account details and personal information, which have been specified in the POISON profile. Translation is carried out within 3-7 days. Now you know, how to transfer money to Yandex purse, and how to remove them from your account. Do not forget to specify the information from specific service providers and banks.